OK, I loved this golf story! I have played in a lot of pro ams and I've heard a lot of funny jokes and one liners but this one was original and really good. I like playing with people who can have fun and enjoy the day. That means people who want to focus on their shots, but in between shots, actually want to visit and get to know you! I believe that is the whole point of pro ams! Well, I played with a guy just like this last month in Memphis in the PInk Ribbon Open. We had a really nice day and I could tell it was going to be nice the night before at the Pro Am Party when we sat together and visited. He told me he was "terrible" at golf but it didn't bother him and he had fun when he got out there on the course. HIs disposition was calm and easy going at the dinner. I met him and the rest of our great team on the course the following morning and we did have a great day. To his word, my new friend was not so good on the course. But also true to his word, he never really got upset and let it ruin his day. I gave him many ideas and swing drills that he gladly listened to and tried out on the course. He was so happy for the opportunity to now practice armed with this new information; which he had never heard of before. He only plays golf 4 times a year or so and he told me it is just a great chance to be outside and be with nature and enjoy the beauty. Golf is kind of like going out on a boat. I want to but I know I’m going to get seasick. I thought that was hilarious. He knows he is going to play badly but he still likes going out on the boat! I hope with some of my lessons, he won't get so seasick! What I Now Know For Sure! We learn some things in life by hearing about it or reading about it. Then we learn some things in life by living it! Here is what I always heard in life and here is what I NOW know to be factual in life; You must be an athlete to be a good golfer- to hit the ball well. I say this because I am in San Diego for spring break and I just finished playing Torrey Pines Golf Course. The day before, I played beautiful LA North Country Club. That is 2 rounds of golf in 3 days and travel time in the car. Remember, it is March and I live in PIttsburgh so I last played a round of golf in September. My swing feels good technically, but as I get older, I notice certain things don't seem as easy to do in my swing. I notice the flexibility that is needed to have the fluidity and timing in my swing- is just not as great as it once was for me. I also notice the muscular strength needed to "go after it" is there……. but produces a slower swing speed for me now. And, lastly the endurance in my muscles, especially the ones that have had some damage or limitations in them as I've aged, is not like the energizer bunny any more. After I finished playing my round and had lunch, my mind wanted to go hit some balls but my body said, "You need to ice your shoulder and rest!" Although I played well and my playing companions applauded my many good shots and how "good" I looked, I am telling you I Now know I am not the athlete I once was and my game is not quite as powerful and dynamic as it once was. It is sad to me and yet I am realistic about it. I've been in good shape most of my entire life, I've exercised and stretched and ate well and felt healthy! I've had the opportunity to play a lot of golf around the world on absolutely fabulous courses. I've been able to compete with some of the best players and was able to watch their talented, coordinated, athletic bodies move through a golf shot! That all has been a privilege and a great learning experience. I will continue to eat well, exercise, get physical therapy on my body parts that are a bit sore right now, do more yoga, and breathe and laugh while on the course. It seems like work to be able to play well; it is. It is also work that allows me to feel great in life and give more of my energy and lessons learned and love to my friends and family and students. I'll keep doing it. I think that is the good fight! To all of you, I give you the nod to keep at it and even step it up if you're so inclined! Be a great Athlete. The pain of Discipline weighs ounces; the pain of Regret weighs tons. Brought to me from my great friend in Seattle. Thanks K! I love your words! To perform at our best, I need to know if you are committed! Mental Mastery helps an athlete look at what it means to be committed. I am the first to say you don’t have to eat, drink, and sleep golf to become great. But, by examining your committement and then targeting the proper aspects of your game that need developing, you can really start to improve your performances. Where are you in this sequence of degrees of commitment? 6. Or maybe even ……. Compelled? If you are committed, I’m sure you have, as part of your training, a type of Mental Training similar to the Mental Mastery Program. If you are not committed and just compliant, do yourself a favor (and us coaches) and don’t act like you think you should improve when you are not even addressing all essential aspects of the game. Practicing Mental Mastery is not a luxury; it is a necessary part of the training! See Missie’s website to order her book on The Mental Mastery Program and for the schedule of her upcoming programs. What a great 4 days in Golf. I met with so many old friends and enjoyed watching Mike Shultz win his award for 2012 Golf Professional of the Year! 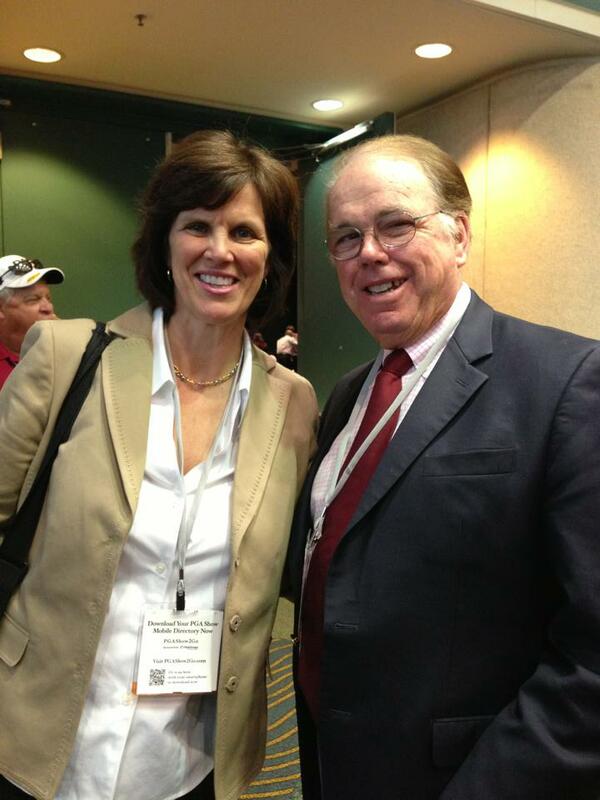 I attended the PGA Show with my childhood friend Andrea Dornin- Kellar. Andrea is a golf instructor in Minnesota and is good friends with Mike and Diane Shultz. It is great to see good people get recognized. Along with catching up with many friends, I attended some of golf’s best educational seminars and have more ideas for my students for the upcoming season! I enjoyed hearing the LPGA will now play in an event similar to the President’s Cup. The event starts in 2014 at the beautiful Tom Fazio designed Caves Valley Golf Course near Baltimore. Tom and I are shown here in the photo. In 2016, the event will be held in Chicago at Rich Harvest Farms, host of the 2009 Solheim Cup! That is exciting news for the LPGA Tour. I also visited Mike Bender’s Golf Academy. It is one of the best designed golf academies and shows us how the best are training the next generation of golf superstars! I practiced a bit along side the “kids” and am so excited to bring those concepts to my teaching in Pittsburgh. I’m hoping we get rid of this white stuff and I’ll keep looking for that Green Grass up here in the North so we can get started! A New Batch of Mental Mastery Graduates! Well, we have finished another Mental Mastery Program just before Christmas. I'm so glad we got it in before the holidays and now the players have this type of coaching under their belt before entering into their spring sport season. I see the athletes mature and figure out better ways to practice in class and I get so fired up about that! I don't think you athletes appreciate how much you plow through all of that mental debris that gets piled up. When this has happened, you go back to your sport and the practice sessions are way more effective and now the development really starts to show! I've seen it many times. I've heard these questions from parents,"Why would I put my younger athlete in a Mental Mastery Program? Shouldn't we wait until they are more advanced? Isn't that when the mental game is maybe more needed?" My response is: When I am with a player for a Mental Mastery Program and we spend 12 hours going through simulated practice sessions and explain and demonstrate how to start a practice session, beginner golfers can really absorb so much more than they would have if they were not aware of some of the converstions we had in our program. They are coachable, and they actually are aware of when they stop being coachable. When they have that skill alone, it doesn't take the beginner student as long to learn certain physical skills in lessons. They progress faster becasue they are aware of the steps involved in the learning process. They know themselves better and they are aware of what they are learning during the initial first attempts. That makes the job of the coach so much easier when the athlete is a good student!